If you can read this writing then either you do not have Java installed, or your Java is not new enough to view the applets on this site. You need Java 1.4 to view these applets. You can change the initial values (at time t=0) for , , and ; as well as , , , and . 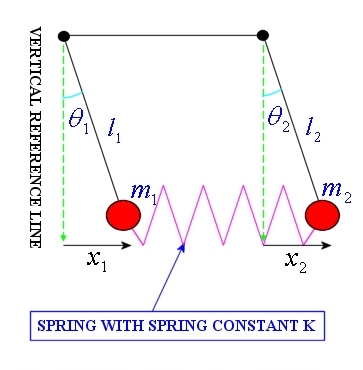 You can also adjust the value of k, the spring constant. This represents the strength of the spring. Also note that this applet only accurately models the motion of the pendulum for small oscillations. The equations of motion used in the applet would need to be altered in order to take different configurations of the system into account.